It has been several years and Beka and her partner Tunstall have been working hard bringing justice to the coves and mots of the lower city. Beka was engaged but her fiancee has just died but the job goes on and a big hunt has come up. Big enough that Lord Gershom – the Lord Provost, interrupts her mourning and confused feelings to send her, the faithful Achoo and Tunstall on the most secret of missions. They are told nothing until they get to there destination where they discover something of the most vilest nature has occurred. It is only the start of a devious plot designed to bring drastic change to the whole kingdom. Never has a hunt counted for so much. The more they uncover, the wider the conspiracy seems to expand, out to people of wealth, privilege and power. These people have the means to hire sorcerers most skilled in dark arts, who are more than willing to use those skills. Joining Beka on the hunt are Lady Sabine and Master Farmer, a mage selected by the Lord Provost. 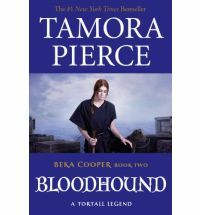 This is a hunt that will test Beka to the very limits of her Dog abilities, as well as her ability to judge which of those around her to trust. This was a review where I found myself unsure where to start and what to write. The biggest test is how to do this, to say what I want to say without resorting to spoilers. I think the only way to really do that is to keep it brief. The world of Tortall is a comfortable fit for those who have read her previous books, it is an old friend and a well worn path you tread as you enter these pages. It is so easy to fall back into the ebb and flow of the locations even though this hunt takes our characters away from the more familiar city environs. The fiancee was a surprise to me and added an interesting layer to the story Pierce proceeds to weave. It is interesting to see a relationship several years down the track, or in this case several relationships. It is also nice to have Lady Sabine more deeply involved in this storyline, it shows her relationships to both Beka and Tunstall as well as giving us the chance to see her really for the first time as a noble. Master Farmer is a masterful addition to the team, a new player in various old dynamics. His facade, and personas add wonderful fun and depth as well as more than a few of the more intriguing moments. Pierce reveals the layers and machinations in this plot with a deft hand. I really looked forward to this book and it wasn’t a let down. There were a few surprises and that is all I will say on the matter. Loved it and highly recommend it. Well let’s hear from one of my fave authors. Beka Cooper is now a fully fledged member of the Provost’s Guard. She is a Lower City Dog dedicated to keeping the peace in Corus. Things aren’t going smoothly for Beka, she can’t keep a partner and while in between them she is re-teamed with Goodwin and Tunstall, it’s not the way it’s meant to be. Then counterfeit coins start turning up all over the city, merchants start raising their prices, there is talk of grain rot and people start to riot. Then someone with a vendetta comes after Beka. If crisis is to be averted Beka has to go into unknown territory. She and Goodwin go undercover to Port Caynn, plunging into the gambling halls and the Rogue Queen’s court. Corruption runs deep though and Beka struggles to play her part, but she is determined that nothing and no-one, not even the flirtatious Dale, will jeapordise her mission. This is a strong sequel to Terrier. Corus is a familiar place, whose streets are, if possible, even more tension filled than before. Port Caynn is painted with a confident hand that helps it jump off the page. Beka is a wonderful character who relies on her brains rather than her gender to succeed in life. Her attractiveness is in her competence and loyalty not her curves or fashions. Her friends are delightfully developed, it is a joy to read their stories and interactions. Colour comes not just from location description but character as well. An engrossing read that I had to revisit and will again before Mastiff comes out in November. 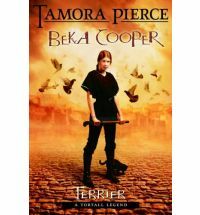 Beka Cooper has wanted to be a Dog for ages, despite the fact that the Lady of the house she has been taken into abhors the idea. Her instincts are what got her family into the Lord Provost’s house in the first place though and he is proud of her. Beka is finally where she wants to be, a trainee Dog in the Lower City. It’s the toughest assignment but it’s where she was born and where she wants to be. When she is assigned to Goodwin and Tunstall (the two best Dogs in the Lower City) she couldn’t be happier. Beka isn’t an ordinary lass though, for she can hear the voices of the unhappy dead. When she hears the rumours of a brutal killer taking the lives of the children of her city, Beka is determined to do something. She works beside and learns from the best, gets entangled in to goings on of the Rogue’s Court and follows her instincts on the trail of two sets of murderers. Beka is there to see justice is done, even if she is just a puppy. 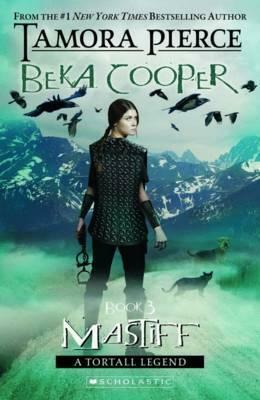 Beka Cooper is probably one of my favourite characters from YA fiction, (if not my favourite). She is smart, stubborn and loyal. She works hard and does her best for those around her. She learns from her mistakes and takes poop from no-one. The Dogs are tough men and women, the new Rogue and his associates are smart and charming. Beka attracts all sorts to her and they work well together even when they find themselves on opposite sides of the law. Pierce has created a rough and dirty world with characters to match and it is one incredibly compelling package. I grew fond of these characters quickly and have returned to them in between new installments.